I am considering my next “woody” likely a Claro walnut topped SH550, looking for opinions on the body wood for a SH550. Walnut neck and body might look great but I am concerned about the weight. Last edited by dbone on Wed Sep 12, 2018 7:45 pm, edited 1 time in total. I'm kind of with you on the mismatch of coloration between walnut and most other Woods. However, I think this can be mostly mitigated with a light-colored middle layer with the 3PB option. Especially if it's something as light as Maple or Ash. Without that, I feel like my favorite Walnut top guitars have Ash bodies. Next would probably be Alder. Mahogany and koa seem too orange when compared to the sometimes slightly purpley Walnut... And black and white limba, to me, have just a slight bit too much green. Last edited by spudmunkey on Sun Aug 12, 2018 10:54 am, edited 1 time in total. In some ways white limba or a summer Ash seem a like a good match with walnut, kinda of like a just poured guinness look. But is it too much contrast hmm. Gumby I would like to see some side and back shots on those they are both lovely. Last edited by dbone on Sun Aug 12, 2018 11:17 am, edited 1 time in total. Summer Ash or Mahogany should work well with the walnut top. Black limba will be heavy if you're worried about weight. My black limba CS6 is heavier than my mahogany one. Doctor Doug wrote: Black limba will be heavy if you're worried about weight. I am of the understanding that Walnut is pretty heavy so yes it’s definetly a concern. The SH550 is a semi hollow but I would like to avoid selecting all heavy woods. I have read somewhere that black limba is heavier than white limba not sure how much. i’m sure they all vary a bit. In brief comments in Q&A, Jeff's said that black limba is more like walnut in weight and tone, while white limba is more like mahogany in weight and tone. Also keep in mind I think they're doing a chrome logo standard on the thing oil builds so they don't have to clear coat over it, so call in and ask. I feel that I may have a little bit to add to this conversation as I have these, a SH675, a C66 and a V69K all of which have a Claro Walnut top on a Walnut body. In addition I have a C7X with a Burled Maple top and Walnut body, a SH7X with a Quilted Maple top on a Mahogany body and a ZA7 on the way with Claro Walnut top on a Walnut body. So in my opinion a walnut body is the perfect mate to a walnut top, if you don't mind the ~2 lbs difference over ash. My SH7X is the heaviest Kiesel that I own next to my V69K. My lightest guitar is a 6.5 lbs Godin Passion Custom with a Red Cedar body and a Swamp Ash top. SilkyHotLicks wrote: I feel that I may have a little bit to add to this conversation as I have these, a SH675, a C66 and a V69K all of which have a Claro Walnut top on a Walnut body. Do you recall the weight on the SH675? dbone wrote: Do you recall the weight on the SH675? How do you like the tone on the SH675? dbone wrote: In some ways white limba or a summer Ash seem a like a good match with walnut, kinda of like a just poured guinness look. But is it too much contrast hmm. for the SH, scroll through this thread.... first post will have it! Here are a few pics of Claro Walnut on Mahogany. This is Claro Walnut on top of Alder, with a middle layer of 'I believe' Mahogany. I really like it. It has S22 pickups and I use flatwound strings on it. I would go for plain white limba. And ask for a lighter piece--and nice and plain, no beetle poo! I think that would work well as an organizing (visually) springboard for the phantasmagoria of the claro, and also as a very sturdy tonewood for the guitar to jump off from. The strong mids of the limba, just a bit more barky than mahog, would be a good fit imho. I always find walnut very pretty, though not as much so as koa, but soundwise w acoustics, it's just an evenhanded, warm wood.. nothing that spikes in any particular region. 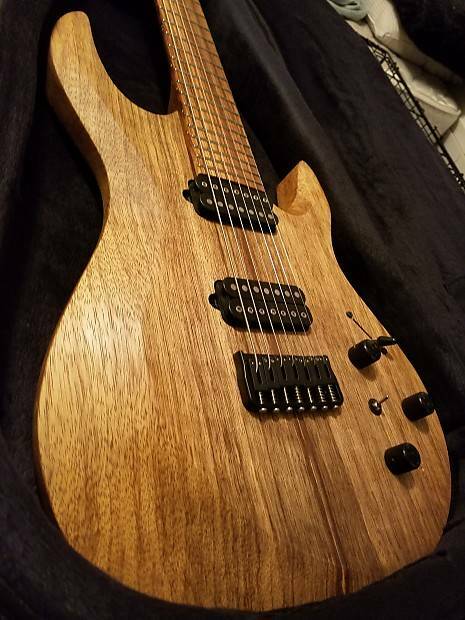 I would go for a body wood that was still in the mahogany "classic body wood" category (ie for humbuckers and SH's, ie mahag, or koa, or either of the limbas) because I don't assign all that much contribution in sound to tops... but especially for a Kiesel SH with walnut, I would almost treat it as no wood at all on top, just a slight bit of added weight for cosmetic purpose. 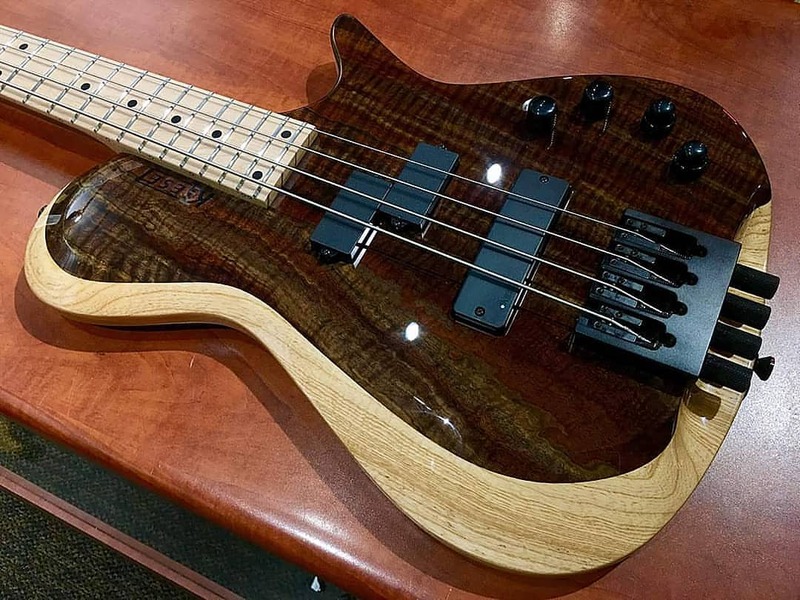 I would go white limba for just that little extra doink in the midrange. And the clean striking look. They're still super cool guitars, a thing entirely unto themselves. In a world of unlimited funds, I'd love to build out a koa FG, and a limba/birch 550.